Dischidia is a family of epiphytes from SE Asia and Australasia. It is closely related to Hoya although it is vegetatively a much smaller plant and the flowers are usually not showy. Almost all of the species have close relationship with ants and many have evolved interesting vegetative aspects to attract ants. They are some with pouch leaves where ants can build nests within, another type have disk shaped leaves pressing against the trunk which again act as ant shelter. Two other types of Dischidia are not designed to attract ants (although they usually are found around the aerial ant nests), having either flat thick leaves (as in D. hirsuta) or bearing small knob-like leaves along very long internodes (eg D. bengalensis). Researchers have trace the movement of radioactive carbon and nitrogen atoms from ants to plants, confirming that the plants assimilate matters brought in by the ants. Dischiodia pectenoides shows the interesting pouch-shaped types leaves. This has the most complex pouches in the family. It has nice bright red flowers too, and hence is the most popular horticulturally. Variegated form of D. pectenoides. 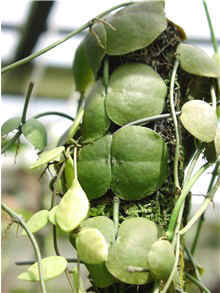 Dischidia hirsuta is a common epiphytes in lowland to mid-altitude forests in SE Asia. 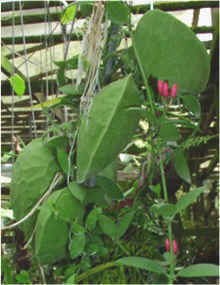 The purple flower is large for a Dischidia and may appear profusely if conditions are optimal. The small leaves and wiry stems are covered with small hairs, hence its name. 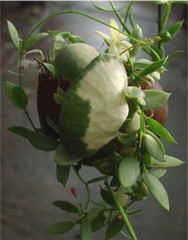 Grow them in a bright sunny place and keep the roots moist and it will reward with its interesting bloom all year round. Dishchidia imbricata has nice disk-shaped leaves flattened against the tree trunk. The flowers are small and inconspiuous.